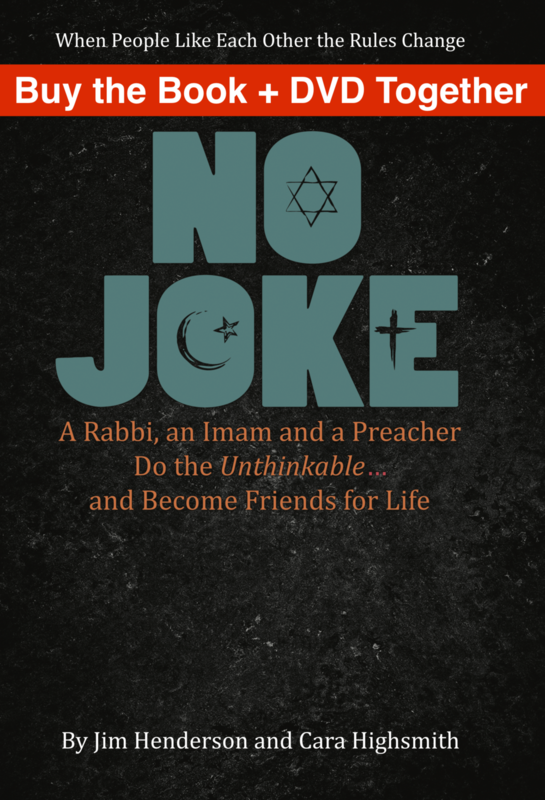 When we met the rabbi, the imam, and the evangelical preacher in Peoria, we had only the faintest inkling of where it might all lead… Find out more at NoJokeProject.com. A rabbi, an imam, and a preacher . . . sounds like the setup to a bad joke. But it’s not. Rabbi Daniel Bogard, Imam Kamil Mufti, and Pastor Jim Powell’s friendship lives in a space many Americans can’t conceive. This feature-length documentary removes the guesswork … these three men came to love and respect each other in spite of themselves. $21.95 with free shipping in the US and Canada. Rabbi Daniel Bogard, Imam Kamil Mufti, and Pastor Jim Powell cracked the code on staying in the room with difference. From what seems like a highly-improbable union a beautiful movement of peace emerged because . . . when people like each other the rules change. $18.95 with free shipping in the US and Canada. Buy the book and DVD together. $34.95 with free shipping in the US and Canada.